The 2018 calendar has been filled with many 2D Metroidvania game releases. 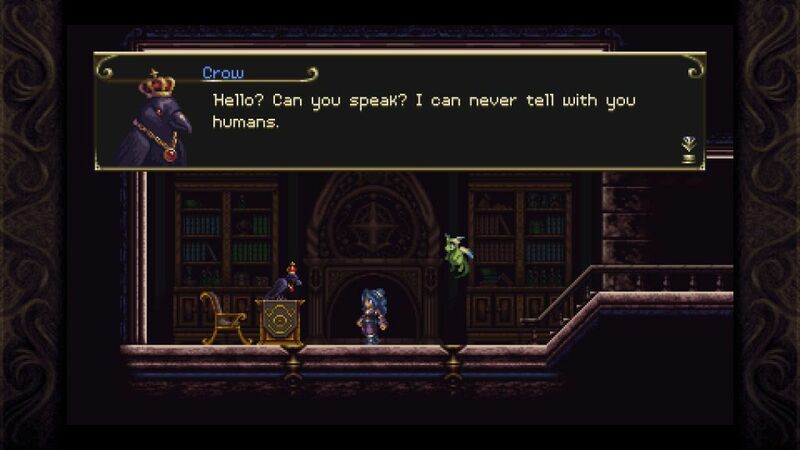 In order to stand out, Timespinner borrows heavily from the exceptional classic Castlevania: Symphony of the Night and mixes things up with having time travel, time manipulation and storytelling being the central elements of the experience. 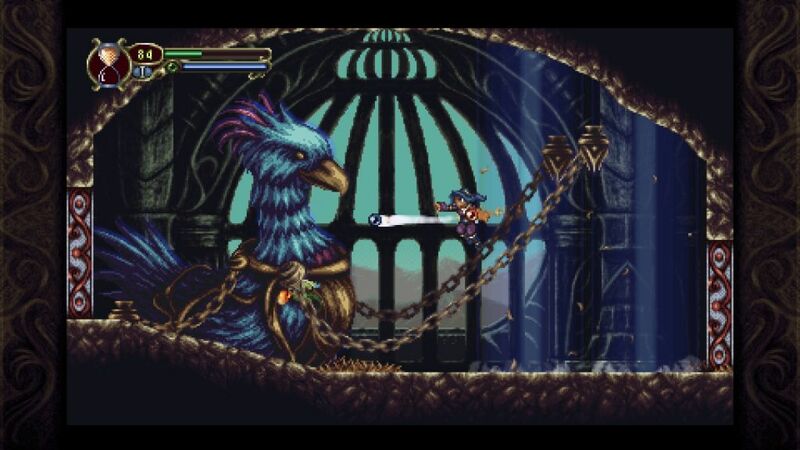 The 16-bit styled pixel art is beautiful, from the screen-filling bosses to the unique, otherworldly environments Timespinner consistently impresses across its 5-10 hour adventure. The opening of the game quickly unveils the driving forces for the plot and describes the world in great detail. You play as Lunais, a gifted young woman who has been training to be a timekeeper in case her village is found by the sinister Lachiem Empire. 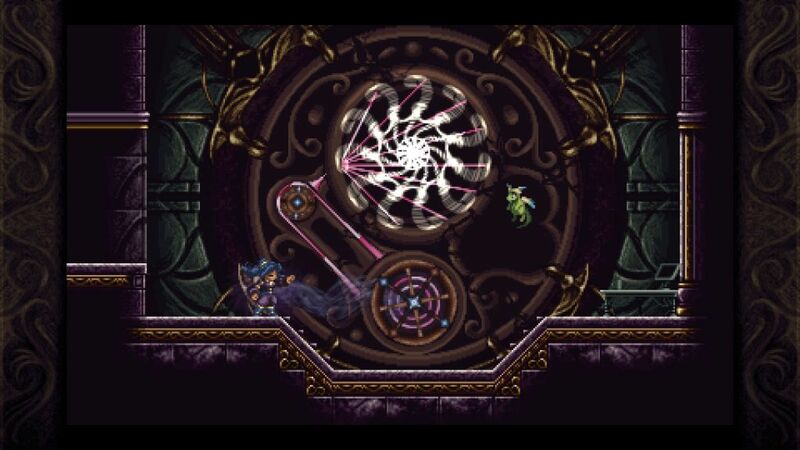 A timekeeper can use the Timespinner to remove themselves from existence and can therefore travel back in time to warn the village of impending disasters. The cost is great, but the village has been hiding and on the run for generations, keeping their timekeepers trained and the Timespinner safe. There are many moving pieces within this plot. I found the world and its inhabitants interesting; it is not often I take the time to completely read all journals, memories, letters, etc. to glean every possible detail in a game. The relationships between characters are fully explored, and motivations for major decisions are heavily based around this. There is one major plot point that is mishandled, and you will know it when you get there. What should have been an emotional reveal is presented to Lunais and simply shrugged off without any significant thought. Luckily, all other motivations and interactions are handled meaningfully and intelligently. The game does a great job of including all types of relationships and people; I would say it is the most progressive game I’ve played yet. Quests can be undertaken from these characters you meet, giving you more information about the people and the world; with the added benefit that they unlock more items for sale in town shops. Oftentimes these missions consist of killing enemies until they drop some items, or visiting specific environments to find information. I found that quest items didn’t always drop easily, leading to repeated slaughter of specific monsters until they eventually discharged the promised loot. They are optional quests, but the frustration is worth mentioning, as the rewards were often worth the tedium, which only encouraged further questing and more waiting for items to drop. Gameplay consists of standard 2D action platforming, with some time travel flair. Progression is made by defeating bosses and finding new abilities to add to your arsenal of traversal, opening up new areas for exploration. There are multiple time periods of the same world to explore, and amazingly it doesn’t feel like visiting the same place twice. Over one thousand years apart, the two maps have enough similarities to be meaningfully connected, but never too familiar to be repetitive. Beginning with only your ability to freeze time momentarily and some basic jumps, Lunais gains many interesting and powerful upgrades throughout the adventure. This leads to backtracking on old areas to access previously inaccessible rooms or treasures. The map has a convenient feature that allows for markers to be placed as reminders anywhere you please, which I used several times and found quite helpful. Combat mixes things up by allowing you to equip yourself with combinations of unique magical orbs (one in each hand) and clobbering foes with the resulting style of attacks. Many types of orbs are scattered throughout the world and level up as you use them in battle. These orbs take the place of more traditional weapons, and are a welcome change. They range from simple balls thrown at the enemy to ones that transform into blades and strike in close quarters. There are also rings that give passive effects and necklaces that teach a spell which can be charged up and released to do considerable damage. Outside of combat equipment, Lunais can be outfitted with a helmet, armor and two accessories. Finding more powerful treasure as you explore is always exciting, equipment upgrades feel substantial and meaningful when put into play. Timespinner starts off simple, and evolves into a deep gameplay experience with a rich story. There are so many details packed into the history of the world and thoughtful design choices regarding the characters. Seeing how my choices impacted the timeline as the game reached the climax was exciting and emotional. I’m left very impressed, and excited to play through on New Game +, or even challenge myself to the Nightmare difficulty!